The Ruger New Model Single Six family is arguably the gold standard for small frame, single action revolvers. Of the twenty-four standard models offered, fifteen accommodate the .22 Long Rifle cartridge. The Single Six is stout enough to be also chambered in .17 HMR, 32 H&R and 327 Federal Magnum. The Single Six is made entirely in the U.S.; foundry, process, machining, assembly, and finesse. I’ve never had one break or wear out. But what about folks who just need a quality utility rimfire revolver, devoid of finesse bells and whistles, and with a price tag to match? Recreational target shooting, varmint control and/or a first handgun to learn firearm safety and to advance marksmanship skills; the New Ruger Wrangler is an ideal fit. 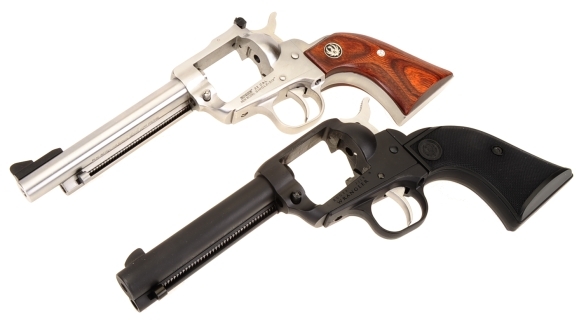 The Ruger Wrangler shares a core design with other Ruger New Model single action revolvers; small, medium and large frame. There are some minor operating differences, as well as some differences in material selection, part manufacturer and finish. As an example, the Wrangler has a free spin cylinder pawl and an absence of detent indexed positions when loading. So where the Single Six allows only clockwise rotation of the cylinder when loading, and clicks as each chamber passes the open loading gate, the Wrangler rotates in either direction when loading and is click free. 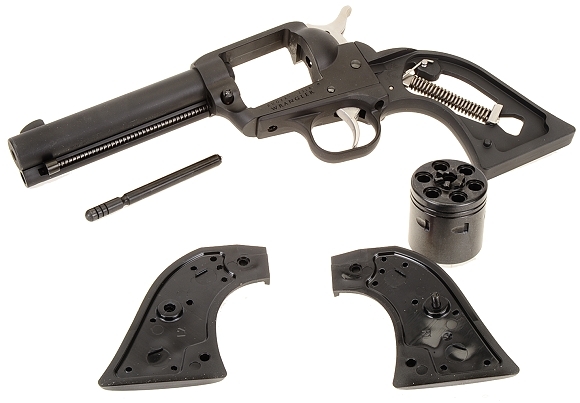 The construction of the Ruger Wrangler is quite a departure from the Single Six. 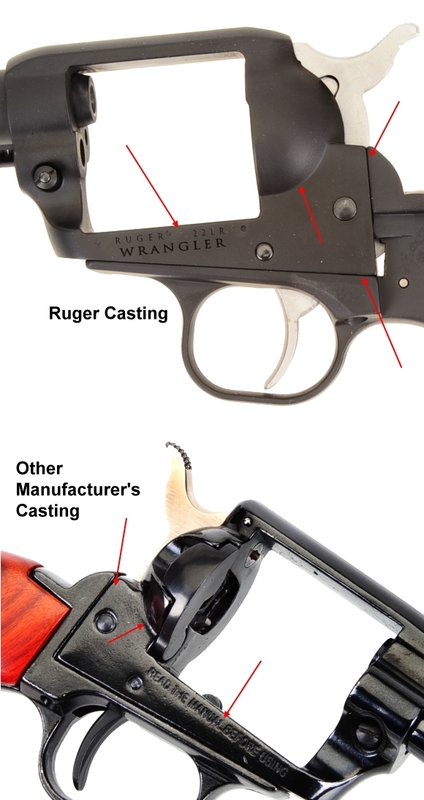 The Wrangler’s grip frame zinc die cast, where the Single Six is either steel or aluminum, depending on model. Zinc castings are impact and corrosion resistant, cast to a tight tolerance and require virtually no secondary finishing after being pulled from the mold. The process of die casting is faster than other materials, less material is required because of the precision of the casting and the molds are permanent. An excellent way of reducing cost without diminishing quality. The cylinder frame is aluminum, the barrel and cylinder are made of alloy steel. 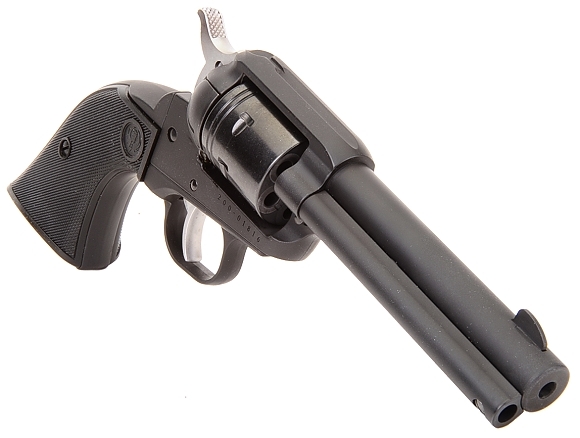 The unfluted steel cylinder has a satin black oxide finish, the hammer and trigger are natural finish MIM material, the rest of the Wrangler is finished in either a matte black (subject revolver) or, alternatively, silver or bronze Cerakote. Cerakote is a Polymer-Ceramic Composite coating that can be used on virtually any type of metal, plastic or even wood surfaces. It is highly resistant to wear and exposure to abrasive surfaces. It is also corrosion and chemical resistant. While Cerakote forms to a hard surface, it does a good job of withstanding impact damage, scratched and chips. .Again, cost reduction, without quality or performance reduction. I believe the suitability of using MIM parts, Metal Injection Molding has been flogged to death and found to have two basic underlying causes for concern; some people’s inability to cope with change, and a manufacturer’s capability or lack of the same, in using the technology. It is process versus machining, and Ruger happens to be very good at both. 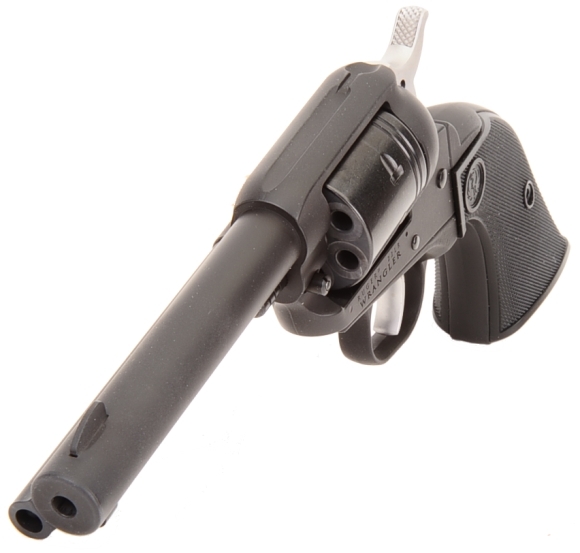 So the Ruger Wrangler has a hammer with some relieved areas and a trigger with the same treatment, and the finish on both is that of matte finish stainless steel. They look appropriate in context with the Wrangler’s other finishes. Again, a method of cost reduction, which feeds a lower price tag, without diminishing quality of performance. No, the picture is not worth a thousand words, but possible thirty to thirty-five. With the grip panels removed, the Single Six type mainspring and trigger spring can be see… if you put your glasses on. The grip panels are interchangeable with Single Six grip panels, so if you don’t like the checkered plastic grips, the alternative are multifarious from both Ruger and aftermarket suppliers. The Ruger Wrangler is quite a compact firearm that carries light on a belt and it is compatible with all Single Six holsters. Just 1.4″ across its cylinder, the subject pistol weighed only 28 Oz. compared to a nominal spec of 30 Oz. The sights are simple blade front, frame notch rear with a 0.100″ aperture. The matte finish does a good job of killing glare. The Wrangler cylinder next to a stainless steel Single Six cylinder. Both cylinder bodies are 1.400″ long. The Single Six Cylinder at 1.420″ is diameter is 0.022″ larger than the Wrangler. Keep in mind, the Single Six is also chambered for .32 caliber centerfire cartridges. The Single Six throats looks a lot smaller, but that is just an optical illusion, mostly brought on by me not cleaning the Wrangler cylinder. Both set of throats bore gauge checked 0.225″. While the top strap of the Single Six appears to be considerably thicker than the Wrangler, net of the Single Six rear sight boss and the Wrangler’s raised surfaces to form its integral rear sight, they are both approximately 0.200″ thick. The frame cylinder windows in both are 1.580″ long below the top strap corner radius. The Subject Wrangler’s window height at 1.460″ high measured 0.010″ higher, but that could just be production variances. The balance point on the Wrangler is farther forward than the Single Six with comparable barrel length, which I would attribute to the difference in cylinder and grip frame materials. At last count, there were approximately 125 readily available types of 22 Long Rifle ammunition. To avoid creating an ammo bill equal to the national debt, four types were selected as typical and suitable for assessing the Wrangler’s performance. Left, typical of groups shot with Federal Champion bulk pack ammo. 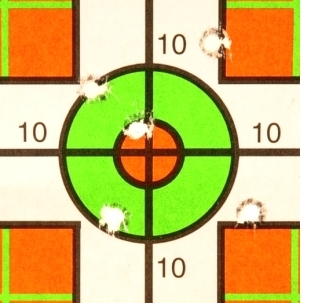 I was pleased with the revolver’s accuracy and repeatability within an inexpensive ammo type. To tell you the truth, they all shot good enough for plinking duty and recreational target shooting. I have a large supply of Remington Cyclone ammo, and I am always in search of a gun that will shoot it accurately. So far, ten years and no takers. But it is fast. The greater truth in regard to accuracy and handling probably resides with the number of pine cones and tree fall branches that fell to the little Ruger while walking the surrounding woods.The only thing that took a little getting used to was the black sights that tended to get lost in less than bright sunlight and against a dark backdrop. Velocity is about as expected for this length barrel, as .22 LR rimfire ammo’s rated velocity is based upon a 24″ barrel. Considering the typical shooting distances and the type of targets in the receiving end, velocity is sufficient. 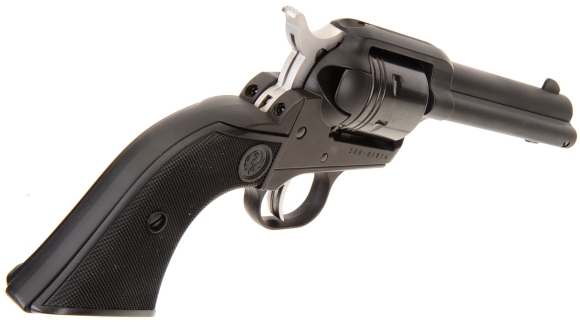 I have previously worked and reviewed two other brands of single action firearms at or near this price point, including a good deal of live fire time. I think the picture above illustrates how Ruger’s foundry and other manufacturing technology pays off for customers. The Ruger cast parts are clean, dimensionally precise and assemble into a quality firearm, even when budget priced. 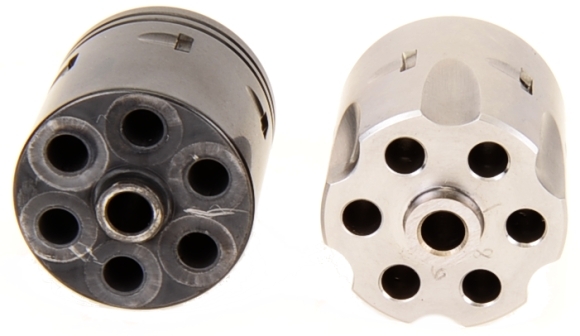 The lower revolver grip frame and cylinder frame had a width difference of over 0.030″. The pin fit was sloppy, the surfaces uneven below the finish. The fit of parts and assemblies were crude and uneven in operation. The Ruger parts, even with different material castings fit precisely, evenly and work well together. The difference pays off in accuracy and longevity of use. The third brand, not pictured, quit after three shots when the trigger broke off. With Ruger, it is the same excellent quality they put into all of their products and backed by the same warranty. When I find myself in a quandary, on the horns of a dilemma, or just can’t concentrate while watching the last season of Game of Thrones, I complain to my wife until she is forced to ask me clarifying questions; “Why do you like the Wrangler?”, “Why don’t you like the Wrangler”, “Why are you forcing the use of the term ‘rife with ambiguities’?”. The truth of the matter is, I didn’t like the Wrangler before I took it out of the box. 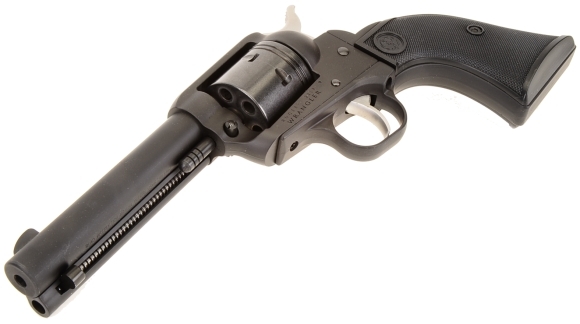 Anticipating what Ruger might have done to my favorite rimfire revolver, the Single Six, I was prepared to jump in and attack every difference. Then I saw the revolver, took it out shooting on woodland trails for a couple of weeks, and took it apart and inspected it closely. In fact, it is sitting on my desk at the moment, and I want to get out and shoot it before the day gets much further along. My conclusion? 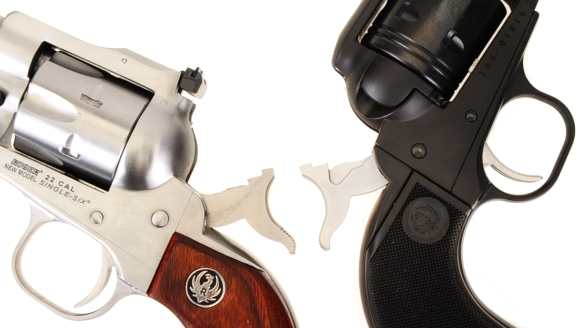 The Wrangler gives enthusiasts the opportunity to own Ruger quality, in a good looking revolver, at an affordable price. The Remington Model Seven is a truly useful product. While long barrel, match weight 6.5 Creedmoor rifles are terrific for 1,000 yard competition and downing pronghorn at similar distances, most Americans do not have access to or frequent long range shooting facilities or hunt the country’s Western plains states. No, we drive to mostly hundred yard shooting ranges and hunt deer at a similar distance, maybe stretching that out to 200 yards. So in the first demographic of a buyers’ market resides a dozen guys and in the second demographic is everyone else. If you were a manufacturer, which demographic would you gear up to serve? 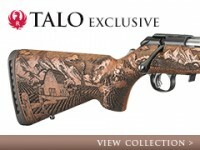 The Model Seven has been in production since 1983, however, the Seven utilizes the smallest of Remington’s actions. Introduced in 1963 as the core of the Remington XP-100 bolt action pistol, the pistol remained in production for thirty-five years, earning a solid reputation for accuracy and reliability. The Model Seven action, in comparison to the Model 700 short action, weighs one half pound less; 6 lbs 11 oz vs. 6 lbs 3 oz.. The receiver ring, bolt body and lug diameters are the same. 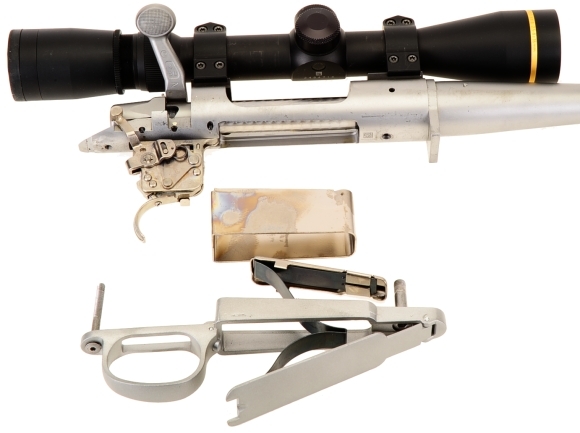 The Seven action measures 5.25″ long, one half inch shorter than the Model 700 short action and the Seven’s bolt stroke is 4.50″ compared to the Model 700 bolt short action’s 5.00″. Scope base fastener threads are 8-40, barrel shank threads for those who can’t leave well enough alone are 1.062″ x 16 tpi, the same as the Model 700. For me, a composite stock begins with a CNC machined bedding block that is matched to a specific barreled action. When the stock is manufactured, the bedding block is inserted in a mold and hand laminated with Kevlar, fiberglass and carbon fiber. The mold is then injected with high density polyurethane foam before it is hand finished to final form and aesthetics…. flat black with spruce-green spiderweb. Not an inexpensive endeavor. This is the type of premium composite stock on this HS Precision version of the Model Seven. The contribution made by the stock is to provide a very stable connection between the stock and barreled action for shot to shot precision and the stock’s material is very stable across a range of extreme weather conditions. And what is with the raised spider-webbing? They provide a very effective non-slip surface. It all goes well with the all stainless steel barreled action. Below, the rifle and stock were cut up to illustrate further detail. No, not really. Remington Model Sevens always had a speed bump at the forend to create a uniform and predictable pressure point. The HS Precision version is no different with a small insert just aft of the sling swivel mount position. Center above, a portion of the bedding block is visible through the stock. Immediately ahead of the block is a well in the stock that retains the actions recoil lug, the heavy tab sandwiched between the barrel and receiver. Other than at the earlier noted pressure pad, the barrel floats in the stock’s barrel channel. A good combination of appropriate materials: 416R stainless steel barreled action, nickel-plated steel magazine box, stamped stainless steel follower, steel spring, aluminum trigger guard and hinged floor plate to reduce weight. Everything bottom side is flush fit to the stock. This type of assembly is used on all Model Seven rifle with the color of the bottom metal either black or silver to match a stainless steel or alloy steel barreled action. 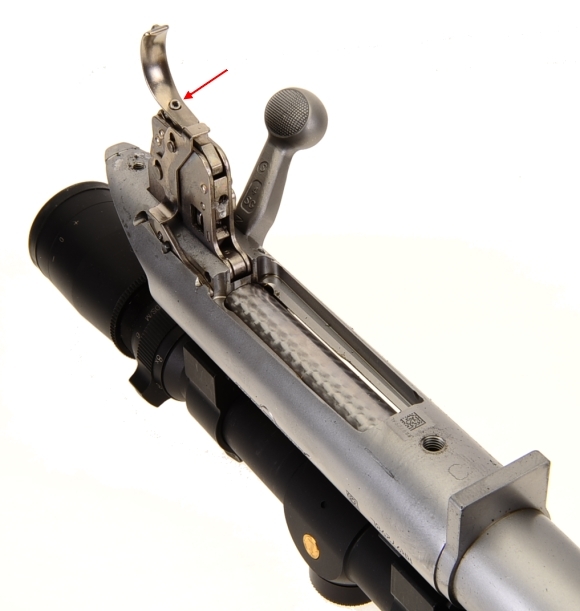 The hinged floorplate permits unloading a full magazine without cycling its bolt and eliminates the downward protrusion of a detachable magazine. Yes, the capacity is set at 4+1 and some detachable magazines offer more, but I would suggest that this Model Seven is slated for a self defense, security applications so the four should be sufficient. The floorplate release button is located high on the front of the trigger guard. The Model Seven has the excellent Remington X-Mark Pro, externally adjustable (arrow) trigger; 3 lbs to 5 lbs. Longitudinal movement of the the stock relative to the action is checked by the action fasteners that pass through the HS Precision stock’s bedding block pass and recess that secures the recoil lug. The Remington Model Seven and all other Model 700 derivative actions have a two lug bolt and 90° lift. Some may find it surprising that the twin lugs have the same lug seat surface area contact as a Browning three lug firearm; each of the twin lugs are larger than each of the three lugs. 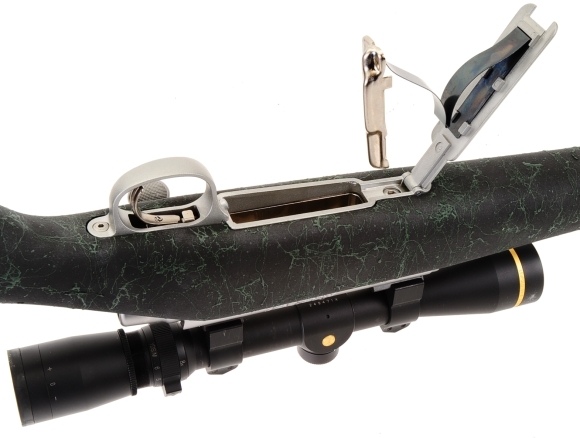 The Remington has its three rings of steel cartridge case head support. In battery, the nose of the bolt fits into a matching groove in the rifle’s barrel shank and the barrel shank is supported by the forward receiver ring. 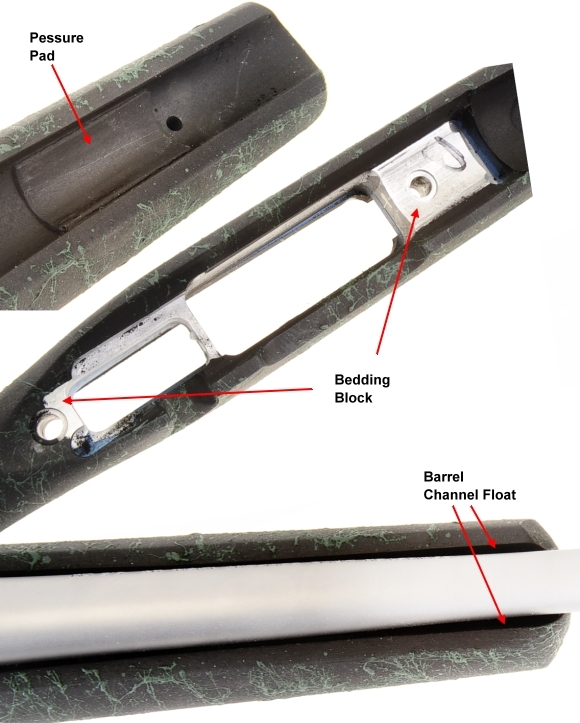 The Remington Model Seven utilizes a spring load plunger ejector that pops empties out and clear of the receiver, regardless effort used to open the bolt. Force of ejection from blade ejector firearms is dependent on speed of bolt opening by the shooter. As a frequent handloader, I like blade ejection so I don’t have to chance brass. 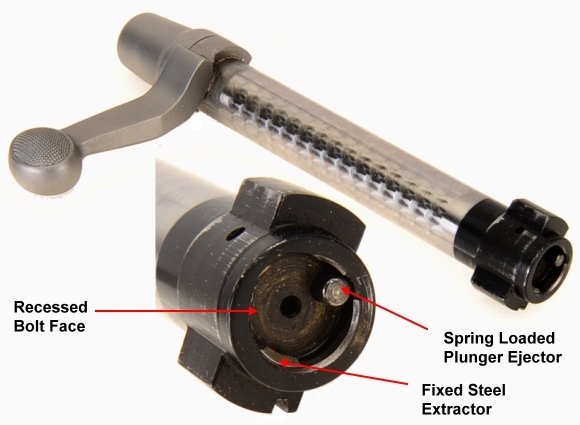 Hunting, a spring loaded plunger ejector assures a clean ejection under any circumstance. Far left, 260 Remington next to a 6.5 Creedmoor. 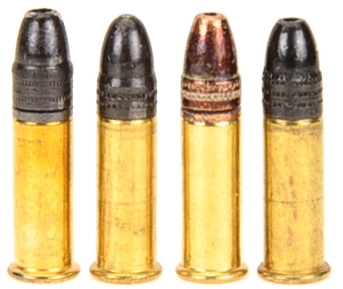 There are a number of good 6.5mm cartridges, however, some seem to cycle in popularity from highly desirable to near obsolescence and back, mostly driven by how many types and brands of firearms are chambered for them at any given point in time. The 6.5×55 Swedish Mauser and 264 Winchester Magnum are examples of this category.The newish 6.5 PRC has not been around long enough to gauge its longevity outside of competitive shooting. In any event, those tend to have too much case capacity for the 6.5mm bore in concert with a relatively short barrel rifle, which leads us to the 260 Remington and 6.5 Creedmoor as consistently present in shooting sports. There are seven configurations of the Model Seven, five are chambered for a 6.5mm cartridge; four for the 260 Remington and one for the 6.5 Creedmoor, with the latter being the subject rifle. Why is the Remington Model Seven chambered for the 6.5 Creedmoor and not just the 260 Remington? Case powder capacity is within a grain of one another; the 260 Remington is a 60,000 PSI cartridge, the 6.5 Creedmoor 62,000 PSI. The Creedmoor case is 0.115″ shorter, which increases net bore length with common barrel lengths. The 260 Remington has 40° shoulders, the Creedmoor 60° and less case taper, the 260 Remington has an overall length of 2.800″, the 6.5 Creedmoor 2.825″. The Creedmoor’s squat case and long overall length results in longer, heavier weight bullets not deep seating and taking powder capacity. If there is some sunshine behind the 6.5 Creedmoor as a more general purpose hunting cartridge, it is coming from the round’s popularity in competition and the endless coverage it receives from industry press. Why is that an advantage? The 260 Remington has been in production twenty three years and there eight manufacturers producing a combined eighteen types of ammunition, with one dedicated to target work. Eleven brands combine to produce fifty types of 6.5 Creedmoor ammunition with eleven dedicated match ammunition. At this moment, there are many more choices for the 6.5 Creedmoor hunter. The 6.5 Creedmoor has been in production for eleven years. We’ll move on to some live fire data collection, both factory and handloaded ammo, to see how the combination comes together. I’m particularly interest in how the more shallow seating of heavy/longer bullets plays out and how much accuracy comes with the HS Precision stock / 20″ barrel combination. Part II will be wrapped up shortly.